KIEV, Ukraine -- The disappearance of a symbol of the revolution comes as President Poroshenko's approval rating crumbles. When revolutionaries stormed the mansion of Ukraine’s President Viktor Yanukovych one year ago, a few of them ran up the winding staircase to the master bathroom, expecting to find the golden toilet that was rumored to be in the house. 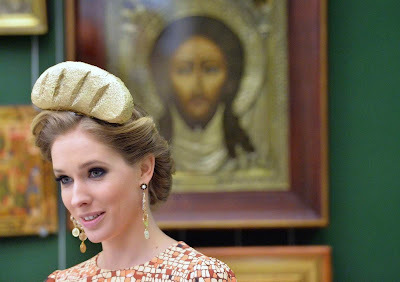 Instead, as they rifled through the gaudy rooms that day, they found something better, or at least more bizarre: a golden loaf of bread, weighing about two kilograms, that a prominent businessman had given the President as a gift in an elaborate wooden box. Of all the pieces of cartoonish opulence found on the palace grounds – including a stuffed lion, a golf course, a private zoo and a floating restaurant in the shape of a pirate ship – the golden loaf became the most famous token of the corruption that fueled the rebellion. In the months that followed, key chains and refrigerator magnets of the loaf were sold on Kiev’s Independent Square as mementoes of the revolution and its promise to make politicians stop stealing from the people. But on Tuesday, March 17, its symbolism came full circle when Ukraine’s new government announced that the loaf had itself been stolen. “It turns out that the location of the famous golden loaf is unknown,” said Dmitri Dobrodomov, chairman of the committee in charge of combating corruption in Ukraine’s post-revolutionary parliament. “In essence, it was stolen. The question is: by whom?” said the lawmaker, an ally of Ukraine’s new President Petro Poroshenko. It was another embarrassing setback for Poroshenko’s government, which has struggled to keep the pledges of the revolution over the past year as Ukraine fights a war with Russia’s proxy militias in its eastern regions. “With one hand we’re firing back at the aggressor, with the other we’re speeding up reforms,” Poroshenko said in a speech last month, on the one-year anniversary of the uprising that brought him to power. But Ukrainians are getting impatient. At the start of February, Poroshenko’s approval ratings dropped below 50% for the first time since he took office in June, according to a nationwide poll conducted by the Research & Branding Group, a leading Ukrainian pollster. More alarming for his government, nearly half of respondents in the survey (46%) said the revolution had failed to meet its goals of uprooting corruption. One in five said they were prepared to take part in another uprising to finish the work of the last one. “This is an incredibly huge number,” says Evgeny Kopatko, the director of the polling agency. That is especially true when it comes to graft. More than a year since the uprising, not one senior official from the Yanukovych government has stood trial for corruption. The revolution has failed to improve Ukraine’s standing in Transparency International’s annual Corruption Perceptions Index released in December; out of 175 countries, Ukraine stood in 142nd place, still the most corrupt in Europe and still lagging behind Russia, which took the 136th slot. Poroshenko’s reluctance to crack down on Ukraine’s political elites is easily understood. During the past year of war in Ukraine, he has often relied on the wealth and influence of the country’s oligarchs, who have helped bankroll the military forces that are fighting against separatist rebels along the border with Russia. Antagonizing these oligarchs with a far-reaching crackdown on corruption could risk a mutiny among them, which is the last thing Poroshenko needs. “There is a great disappointment in this sense,” says Alyona Hetmanchuk, the director of the Institute of World Policy, a Kiev-based think tank. “People see that the war is being used as an excuse to delay various reforms,” she says. But as the fighting eases and the ceasefire takes hold in eastern Ukraine, Poroshenko will have to turn his focus back toward the promises of the uprising he helped to lead. Yanukovych’s abandoned palace might be a place to start. Although the new government had planned to turn it into a “museum of corruption,” the property has instead become a monument to the revolution’s unfinished business. “It’s all still up in the air,” says Petro Oleynik, the former revolutionary who has been living at the palace for more than a year, serving as a kind of unofficial groundskeeper. In late February, when TIME visited the property, the golden loaf was still prominently displayed in a window, perched alongside a mocking effigy of Yanukovych that sat on the sill. Above it was a sign offering tours of the mansion for 200 hryvnia per person, about $7 at the current exchange rate but prohibitively expensive for most Ukrainians. Oleynik said the profit from these tours goes toward maintaining the house, as does the money from the other businesses he is running on the property, such as the sale of milk from Yanukovych’s cows. But when TIME called him to inquire about the loaf on Tuesday, Oleynik replied that he was busy and hung up the phone. The theft, in any case, would likely not have surprised him. On a recent Saturday, he showed a French family around the property, pointing at various items in the gilded bathrooms, private cinema and karaoke room and stating their supposed prices. Lebanese cedar for the ceiling: $12 million. A shiny trash can near the sink: $700. “It’s another world,” said one of the awestruck tourists. Many of the smaller items, Oleynik explained, had already been stolen as souvenirs, a practice he seemed to feel was unavoidable. Recent interviews of Ukrainians in Kiev show solid mood of patience. Hysteria is not proper at this time.